We offer a variety of products that can be used to create systems for Mining. Many of the major components used to create these systems are listed below. Please let us know if we can help you configure a system. Reliable data can be used to make prompt decisions that reduce risk and liability; promote health and safety; efficiently manage equipment, sites, or multiple assets; and ensure environmental compliance. Our automated measurement and control systems are capable of measuring virtually every commercially available sensor, then processing, storing, and transmitting the data to your cell phone, field office, or corporate headquarters. Data can be communicated through radios, cellular modems, satellite modems, local networks, and the Internet. This accessibility allows for easy viewing and informed decision making in response to changing conditions. Alarms and controls are easily integrated so you can suspend operations, move equipment, evacuate an area, or resume work. Systems can be programmed to send alarms or report site conditions by calling out to computers, phones, radios, or pagers. Campbell Scientific offers training courses that can be conducted at your location and customized to meet your specific needs. Hands-on training with our engineers helps ensure your system provides the site condition data you need today and into the future. Slope stability data can be acquired from known problem areas or a network of measurement and control systems strategically positioned around a mine. Common parameters used by our systems to monitor slope movement include lateral displacement, water level and flow, tilt, soil moisture, crack monitoring, and precipitation. For more information, see the Slope Stability web page. Weather stations provide data that can be used to keep mining operations running when conditions warrant and to shut down when people and equipment need to be protected. Weather stations are often used to monitor wind speed and direction, air temperature, precipitation, barometric pressure, and relative humidity. For more information, see the Weather & Climate web page. Lightning warning systems provide real-time data used to trigger shutdowns or evacuations during pre-strike conditions, as well as to identify resume-work conditions when the danger of a lightning strike has passed. Visual, email, text, and audio alarms are available to promote precautionary actions that can save lives and prevent equipment damage. Lightning warning systems are capable of measuring electric fields, lightning strikes, temperature, relative humidity, wind speed and direction, solar radiation, GPS time sync, barometric pressure, and precipitation. For more information, see the Lightning Warning and Electric Field web page. In surface and underground mining operations, there are often multiple air and water quality conditions that must be monitored to ensure compliance with environmental regulatory requirements. 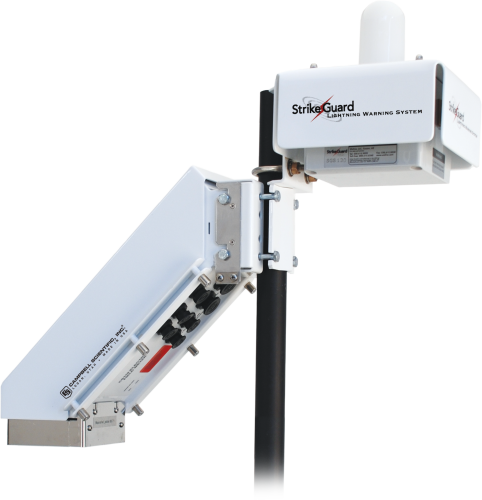 Air quality and pollution monitoring systems automate data collection and reporting processes by measuring solar radiation, gases, particulates, atmospheric stability class, and other required parameters. For more information, see the Air Quality & Pollution web page. Regardless of salinity level, pollution level, or other harsh environmental conditions, our water quality monitoring and control systems are reliable. These systems measure all relevant parameters, including pH, conductivity, temperature, turbidity, dissolved oxygen, level, flow, and discharge. Specified time, event, or measured conditions can automatically trigger a water quality system to control various devices, such as pumps, mixers, valves, and gates. For more information, see the Water Quality web page. Dam and tailings monitoring systems measure water level, flow, and turbidity; slope stability; and air and water quality. Mine ventilation systems measure barometric pressure, air temperature, relative humidity, and air velocity. Equipment performance systems keep mining equipment operating at peak performance levels by monitoring temperature, pressure, RPM, velocity, power, acceleration, position, torque, and strain. Roof and shaft stability systems are used to warn of possible cave-in conditions by monitoring changing conditions, cracks, and load distribution.